Larkspur bear Delphinium-like flowers on upright, strong stemmed plants. Soft green feathery foliage sets off the handsome long floral spikes of double blossoms. Flowers quickly from seed. Larkspurs are an outstanding variety for cut flowers. 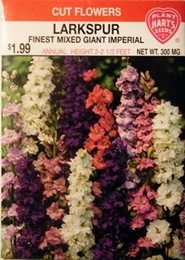 Larkspur prefers a cool climate and germinates best at temperatures in 55 to 60 degree range. Performs best in full sun but will tolerate partial shade. Planting time - Early spring to early-summer.